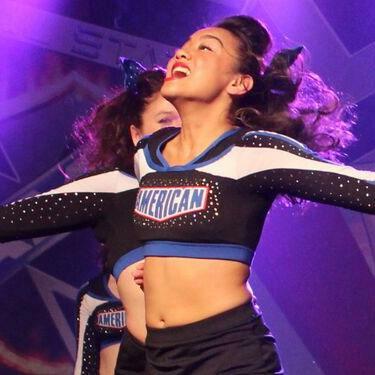 If you're looking for a sports activity that allows you to express yourself proudly, then cheerleading at American Cheer is for you! At American Cheer, you'll find quality value and variety taught by a talented staff. 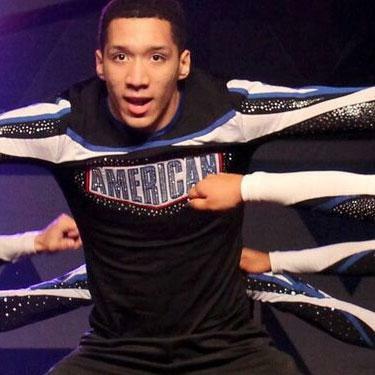 So whether you are interested in learning the basics or challenging yourself with more advanced cheer skills, American offers what you and/or your squad is looking for. Sign ups for Tryouts are open NOW! 2019 Cheer Tryouts are May 15th & 16th, Evaluations are Friday May 17th. Use th Enroll Now button to sign up TODAY. Check out Our 2019/2020 FAQ Videos for More INFO! Jason & Ashley Larkins are an accomplished duo! 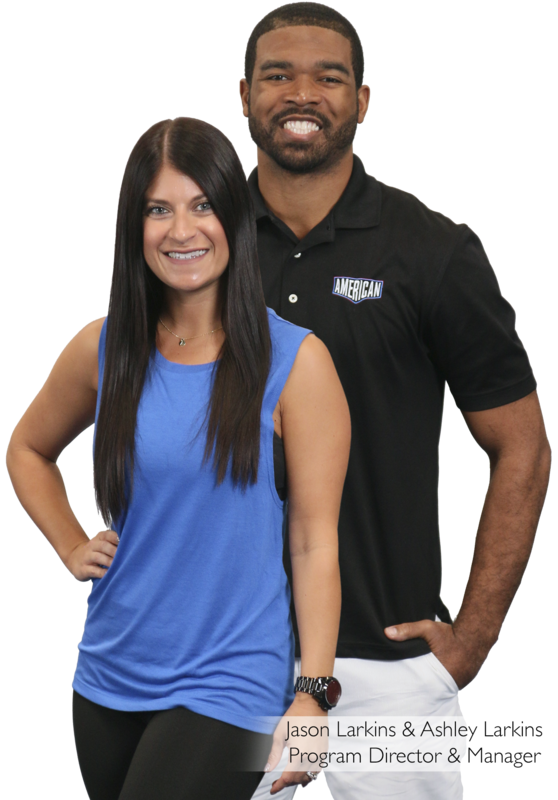 Their resume includes coaching at California Baptist University, winning numerous national titles including NCA, USA, JAMZ, Summit collegiate & All-star championships. Both are former cheerleaders themselves; Jason in college and Ashely here at American Cheer. But what makes them especially amazing is their passion for the sport and their hands on love for each athlete. Our recreational classes are designed to be fun, age appropriate, affordable and a great place to learn the basics of cheerleading! A class for our little ones to have fun learning the basics of cheer: jumps, basic tumbling, and cheer motions. The focus is on fun and working together! This class is for athletes interested in trying out for their school’s spirit squad, and learning what it takes to make their middle school or high school cheer team. Athletes will work on jumps, basic tumbling, cheers, chants, motions and dances. We offer cheer tumbling classes for athletes starting out all the way through to advanced. These classes follow the American Cheer tumbling progression system and are great for athletes looking to advance their skills for personal growth, to make their school cheer squad, or for their all-star team. There is no requirement for our tumbling program, there is a level for everyone. This class is designed for athletes looking to gain flexibility. Flexibility is one of the biggest ways we can help our athletes prevent injuries, improve skills such as tumbling, stunting, and jumps which are so important to cheerleaders.. This is our competitive and performance cheer squads that have made American Cheer a world renowned name. Our all-star program is offered for athletes ranging in ages from 5 to young adult who are interested in competitive cheerleading squads. They travel to compete at state, regional and national competitions here in California, Arizona and Las Vegas. To learn more, fill out the "Ready to get started" form at the bottom of this cheer webpage. Our cheer dept will get back to you with the info you need. Our prep squads are offered for athletes ranging in ages from 5 to 18. Prep squads are athletes typically new to cheerleading who would like to be introduced to the basics, or for families looking for competitive cheerleading with a time, travel and financial commitment that isn’t as demanding as all-star. Prep squads compete at local competitions, as well as the possibility of performing at local events such as basketball and/or football games. Our tiny pre-team program is offered to athletes ranging in ages from 4 to 6 years old. This is the earliest an athlete can join a squad and be introduced to all-star cheerleading. Tiny pre-team squads perform at local competitions as well as the possibility of performing at local events such as basketball and/or football games. These squads are introduced to, taught and perform a routine that includes tumbling, jumping, and dancing, but do not participate in stunting. Our mid-season squads are offered for athletes ranging in ages from 5 to 18. These are athletes typically new to cheerleading and would like to be introduced to the basics of the sport, or for families looking for competitive cheerleading starting in the fall. The time, travel and financial commitment isn’t as demanding as all-star, or as full season prep. They compete at local competitions, as well as the possibility of performing at local events such as basketball and/or football games. Cheer - School/Clinics/Camps & More! American Cheer also offers training to recreational, elementary, junior high, high school and college cheer squads. Training ranges from one-day stunt and/or tumbling clinics, to multiple day cheer camps, or weekly tumbling and stunting classes. We also offer free consulting to local school cheer coaches! Whatever your program is looking for, we can meet the needs and design a curriculum that best accommodates your needs. Does American Cheer offer non-competitive cheer classes for athletes older than 6? Worried about the financial commitment? Coach Jason breaks it down for you! How will All Star Prep cheer impact our life? How much time will it take up? All Star Elite or Prep? Do you want to know the difference between an All Star Elite squad and an All Star Prep squad? What is the difference between All Star Cheer Leading and High School Cheer? How old does your child need to be to start cheering? Coach Jason is here to answer that question. If you are interested in joining our cheer team, please complete the form below for more information! The cheer program has been outstanding for our daughter! She comes home each day wanting to practice because AKSC has made learning fun for her!!! !